Interlab G26 EasyFix is a unique instrument for clinical electrophoresis. 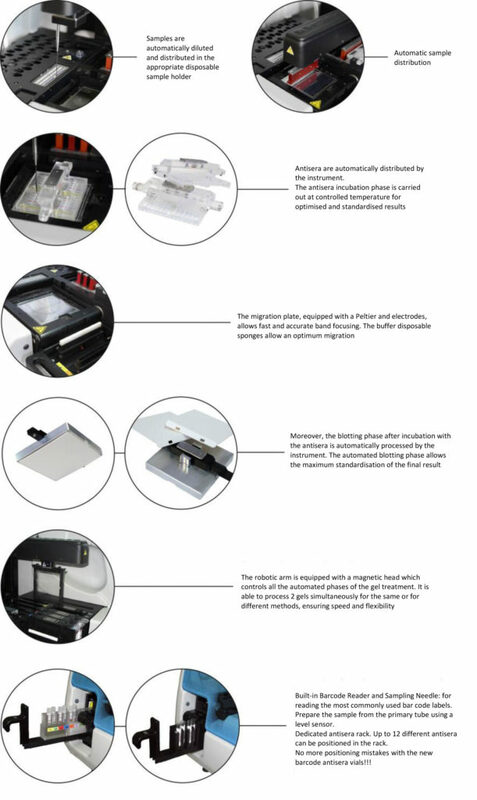 All routine electrophoresis tests can be performed in total primary tube automation, including toilsome and manual methods such as immunofixation. Until now, no instrument could perform immunofixation fully automatically. By using the Interlab G26 EasyFix, all immunisation phases, including sample dilution, antisera incubation and gel blotting, are automatically handled by the instrument. It is possible to simultaneously treat up to two gels, even with different methods. This allows both a high degree of flexibility and a high productivity. Complete automation of the electrophoresis processes reduces operator time to a minimum. The range of kits, available with various gel sizes, contributes to guaranteeing a productivity suitable for any workload, streamlining consumption. In addition to Immunofixation and Bence-Jones, the system performs serum protein, urine, haemoglobin, isoenzyme and lipoprotein electrophoresis as well as CSF isoelectric focusing. 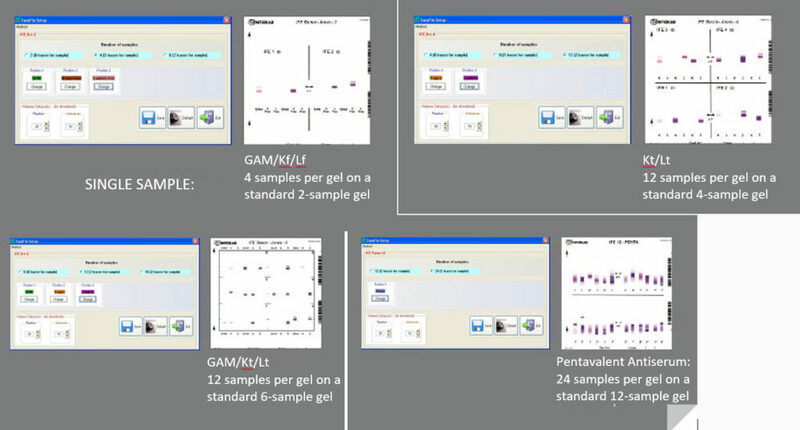 Automatic recognition of the analysis program and simultaneous treatment of up to two gels, even with different methods, allow a flexible use of the analyser. Automatic reading of the test tube, gel and antiserum barcodes ensures traceability of samples and reagents. Maximum standardisation of the analysis processes guarantees accurate results and an easy interpretation. Working with 4 different barcodes, the Interlab EasyFix G26 is a unique system. It minimises the possibility of any mistake by the user. There are 2 different barcodes on each gel produced by Interlab. The first barcode identifies the type of analysis, the second identifies the unique GEL ID. To start the analysis, the user does not need to select the running method. Just a simple click on the start button and the system will select the desired analysis by automatically reading the method barcode. In addition, the GEL ID barcode will be scanned and saved in the Elfolab software. The integrated barcode reader will automatically read the sample tube barcode and transfer the data to Elfolab. Each antiserum vial has a barcoded label. The user will have the freedom to place each single vial randomly in the Antisera rack. The system will recognise which antisera to use and where to find them in the rack. Up to 12 different antisera can be used simultaneously. Such an innovative system must be managed by a high-performing and flexible software. The new Elfolab, with the specific additional features for IMMUNOFIXATION assays, has been designed for the most demanding users. Full automation in a complex analysis such as for immunofixation assay could lead to a lack of flexibility both in the method and in the ability to customise it. The New Elfolab is so powerful and flexible that it is able to provide the maximum freedom for customisation by the user. Here are some examples.